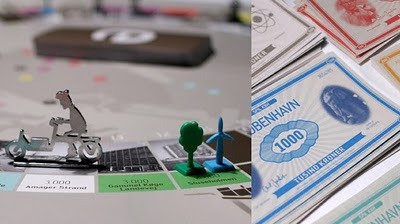 Copenhagen - The Board Game. 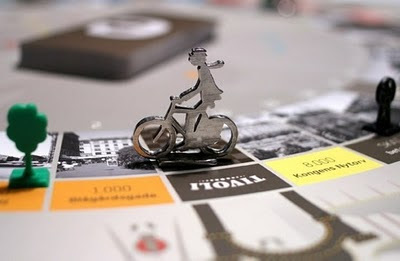 Launched in time for christmas 2009, the game is the definitive Copenhagen experience. 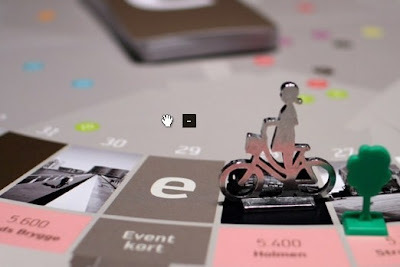 The gameplay is a mix between Monopoly and a popular Danish board game, Bezzerwizzer. 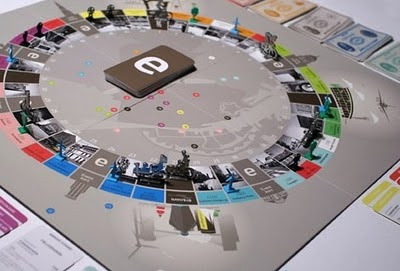 Players move around the board and battle to develop the city in the best way possible. 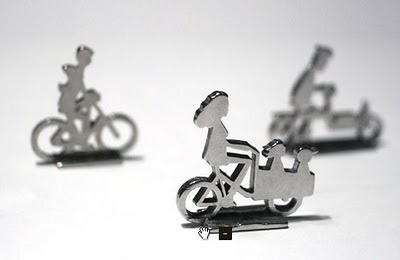 Not surprisingly, the players all choose a metal bicycle figurine to move with. Not a motor car in sight. Classic Copenhagen bicycles like the longjohn, the Christiania cargo bike, the upright granny bike, a child on a bicycle, a Pedersen and even a bent-over racy chap. Appropriate here in the world's cycling capital. The battle to develop the city involves modernity like building communication masts for hi-tech development and erecting wind turbines for generating power. Then there are the human aspects like planning parks and planting trees. I just like the fact that bicycles feature prominently in the game. The design firm Hello Monday produced the game and they put their heart and soul into the quality of the pieces and the general design. It's gorgeous and built to last. I've seen the game but didn't have time to play it. If any Copenhagners out there have tried it, do let us know what it's like in the comments. Roll the dice and build an even lovelier city before the next player does. Thanks to Marcel for the link.